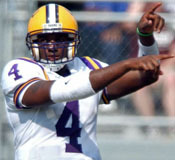 JaMarcus Russell directs the offense. Xavier Carter sets sail to pay dirt. Ali Hightower makes a tackle. Ronnie Prude corrals Derek Pegues. 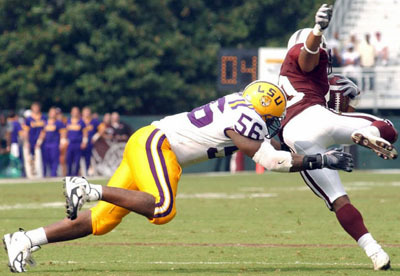 The Tigers didn't have much time to prepare for their trip to Starkville. After the Monday night game, they had only three days to practice before hitting the road Friday for the Saturday afternoon encounter. OT Andrew Whitworth, one of the team leaders, said the goals for the week were simple: heal, master a simplified game plan, and execute it properly. DT Kyle Williams did a slow burn the rest of the week after blowing a 21-0 halftime lead against Tennessee. We had an opportunity to put a good football team away. We got complacent. We can't let that happen again. The best cure for the hangover from Monday night was getting back on the football field Saturday. 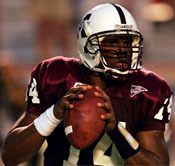 The player in most need of Listerine to wash away the bad taste was sophomore QB JaMarcus Russell, who suffered through a terrible second half, including a blatant INT that set up UT's Q4 TD that brought them to within three. In the sixteen days between Arizona State and Tennessee, the Mobilian went from hero to goat. 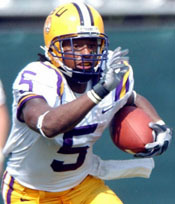 If he just goes out there, relaxes, and plays ball, said Coach Les Miles, we count on him to make some big plays. If he just goes out there and plays like he's capable, that's all we ask. 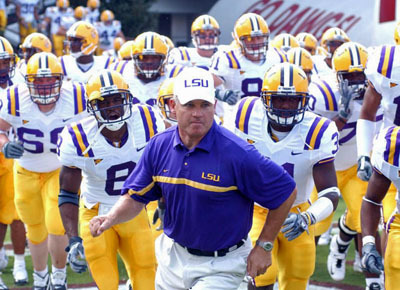 After two games, LSU had allowed 355.5y passing per game. The defense was determined to reduce that number and fast. Fortunately, the opponent didn't provide nearly as big a challenge as Tennessee. The Bulldogs stood at 2-2 after losing to Georgia 23-10 the previous Saturday. 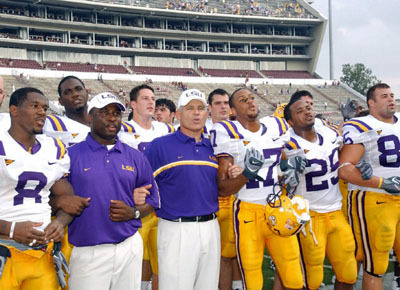 They also absorbed a 28-10 beating from Auburn. 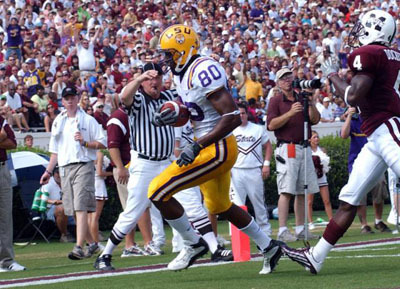 The Tigers had beaten MSU 51-0 in Baton Rouge in '04. Head coach Sylvester Croom, who coached with Bo Pelini with the Green Bay Packers, said he didn't expect any tricks from Pelini. He pretty much knows my philosophy, and I know his. So really it is going to come down to the players executing and playing good football. 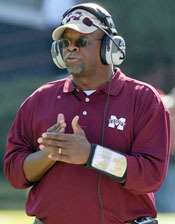 Croom installed part of the West Coast Offense in 2004, his first in Starkville, and added more this season. MSU's dual-threat QB Omarr Conner presented a challenge for an LSU defense that leaned on a soft zone coverage. The Bulldogs boasted two fine runners in senior Jerious Norwood, coming off a 1000y season, and Derek Pegues. LSU started terribly but rebounded quickly. Q1: The Tigers deferred and kicked off for the third straight time. SS Jessie Daniels took responsibility for the blown coverage. As the offense lined up, he tried to shift LB Ali Highsmith into flat coverage. But when Highsmith didn't hear the call, Daniels moved over himself and left Sanders unchecked. I was still kind of panicking that nobody was covering the flat. The check that I made, the corner is supposed to cover the flat, and I'm supposed to be over the top. I messed up. We can give up a 5y gain but not a play like that. 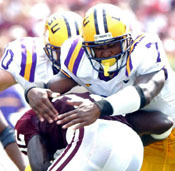 When the LSU defense gathered on the sideline, tempers flared. After the second half against Tennessee, nobody was in the mood for any more breakdowns. The play also conjured up the nightmare of the end of the Capital One Bowl when Iowa scored on a busted coverage. But Daniels defused the situation by confessing his mistake. Everybody on the sideline was really frustrated, and we just came together and said, if we played frustrated, then we're going to make more errors. We just calmed down and, after that, we communicated and were on the same page. The refocused Tiger D forced three straight three-and-outs the rest of the period. The visitors got the ball back in the last minute of the period, and Russell started another march with a completion to Doucet for 16 to the MSU 30. L: Claude Wroten tackles Omarr Conner; R: Bowe snags TD pass. Q2: It took only two plays to extend the lead. Skyler Green scampered for 11 with still another bubble screen. Then JaMarcus fogged the ball to Dwayne Bowe in the EZ from the 14. 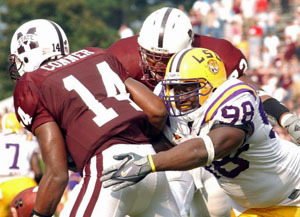 LSU 17 Mississippi State 7 (14:45) The Bulldogs finally started moving the ball again, reaching the LSU 31 before bogging down. Keith Andrews' FG try from the 47 slid wide right. Hollis: I was in the zone covering in the flat, and I saw a running back running at me, and I ran across the field thinking the safety was going to come up and make the tackle. I just came in and hit him. I hit both of them. Both of them were on the ground hurting after that. I double-checked on them because I didn't want to hurt anybody that bad. Ken agreed it was the hardest hit he'd ever delivered. After the game, Norwood said he had no recollection of the collision. I don't know who hit me or what happened. The play gained 19y to midfield. Several more completions gave the Dogs a first down on the 31. After two runs gained 7, Conner rolled to his left, spotted WR Keon Humphries open in the EZ and threw the ball toward him. 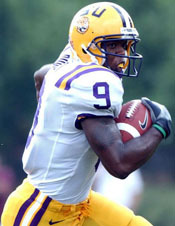 But Ronnie Prude darted in front of the receiver and grabbed an INT that deflated the home team. Connor: I saw the guy (Humphries). He was wide open. But I didn't see the guy (Prude) coming back side. That's my fault. You can't control what happens on the field. You just have to play it one play at a time, and they made it. Neither team threatened in the last 2:40. 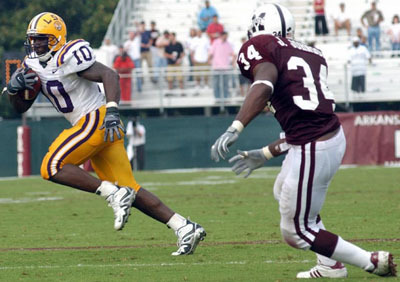 L: Joseph Addai eludes an MSU defender. R: Ken Hollis makes a tackle. Bowe shakes free for TD. 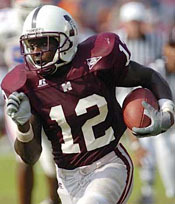 A brief shower accelerated the exodus of Maroon and White fans in the crowd of 48,344. 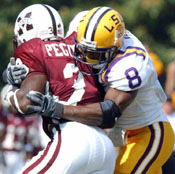 The Tigers' defensive dominance continued as the Dogs went three more possessions without making a first down. Four possessions, 12 plays, -19y. Daniels: We made some adjustments at halftime, but the main thing we talked about was coming out and playing with the same kind of aggressive style we did in the first half. Effort was the biggest key. We wanted to go out and show how good a defense we are. Q4: The Maroons recovered Carey's fumble at the LSU 46 but could do nothing and punted to Green, who made another good return - 28y to the 47. With Matt Flynn at the controls, the Tigers made one first down before punting. The Bulldogs finally made their initial first down of the half against LSU backups and followed it with two more under the leadership of their backup QB Mike Henig. An incompletion on 4th-and-8 at the 13 turned the ball over with 4:05 remaining. Flynn passed to David Jones for 19, handed the ball to FB Steve Korte six straight times to gain their 22nd and 23rd first downs - to just 12 for MSU - and run out the clock for LSU's sixth straight victory over Mississippi State and 12th in the last 13 tries. Tigers sing the Alma Mater after the victory. Miles was asked if he had read any of the negative articles the past week. I don't care about what's being written in the paper. I don't read the message boards. ... What our team has accompolished in a very short season in my opinion shows the character and strength and resolve of the team. Personal vindication? That's for later in life. He summarized the game thus: Same scheme, better execution, and understanding they had to finish the stinkin' game. ... This team came onto the field with an edge. There weren't as many smiles around the coaches' offices this week. On the defense: There was one gaffe. But after that in no way did I ever feel like they were going to mount a sustained drive on our defense. Russell set an LSU record for completion % against an SEC opponent - 20-of-23 for 86.9% - to break the mark set by Alan Risher (21-for-26 for 80.8%) against Ole Miss in 1981. 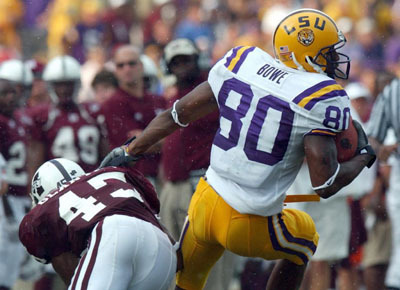 Bowe: Coach said, "We're going to throw the ball. Be ready. Get warmed up." We came out, bam, bam, three times." Croom: The interception before halftime totally destroyed any confidence that we had. And then they come out the second half and stuff it down our throats on defense and basically then the game was over. ... They pounded us. They went straight at us and, when they wanted to, they threw some finesse things and got it to athletes out in space, and we couldn't get them on the ground. ... We had opportunities early and didn't make it to keep the ballgame close. I felt if we could keep it close and go into the late part of the game, our conditioning would pay off. But we didn't. Conner on the early TD: That's how you want to open the game. We established a tempo, playing quick. ... We tried to feed off of it, but we had a couple of stalls.